Today, July 30th only, head on over to Amazon.com where you can save up to 72% off select very highly rated Cuisinart Cast Iron Cookware pieces. PLUS....these items ship for FREE! 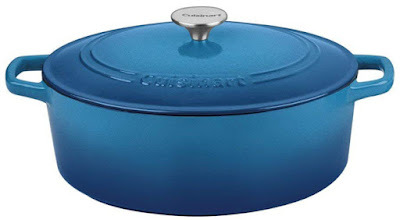 You can score this Cuisinart 5.5 Quart Casserole in Snow White, Matte Grey or Gradient Blue for only $54.99 shipped (Retail $180). This Casserole dish features a porcelain enamel exterior to provide a strong, durable finish that is perfect for cooking, serving and entertaining. Plus, cast iron cookware retains heats and provides even heat distribution and can be used for almost any recipe from roasts to desserts!